Combine the first 7 ingredients, stirring well; set aside. Heat a large wok or large heavy skillet over high heat. Add 2 teaspoons canola oil to pan; swirl to coat. Add chicken; stir-fry 4 minutes or until browned and done. Remove chicken from wok. Add remaining 2 teaspoons canola oil to wok; swirl to coat. 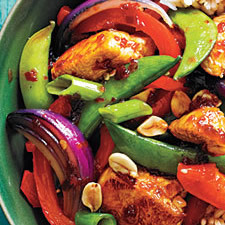 Add sugar snap peas, bell pepper, and red onion; stir-fry 3 minutes or until vegetables are crisp-tender. Stir in brown sugar mixture; cook 1 minute or until thickened. Stir in chicken; toss to coat. Garnish with green onions and peanuts. Per Serving (1 cup): 302 Calories; 10g Fat (30.8% calories from fat); 1g Saturated Fat; 31g Protein; 21g Carbohydrate; 3g Dietary Fiber; 66mg Cholesterol; 402mg Sodium. Exchanges: 0 Grain(Starch); 4 Lean Meat; 1/2 Vegetable; 1 1/2 Fat; 1/2 Other Carbohydrates.